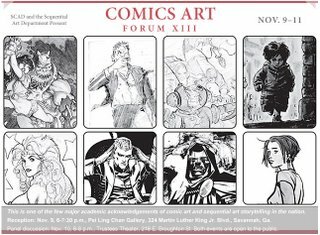 gobnobble -- the comic work of David Allan Duncan: CAF XIII this week at SCAD! I'll try and get a better image to put on here, this is all I could find right off. This is the official press release thing, so it's a bit formal. I had to edit it down. 12 artists this year. A reception where their artwork will be displayed. It will take place at Pei Ling Chan Gallery, 324 Martin Luther King Jr. Blvd., on Thursday, Nov. 9, 6–7:30 p.m. Anyone interested in meeting them is invited to visit Pei Ling Chan Gallery at that time. 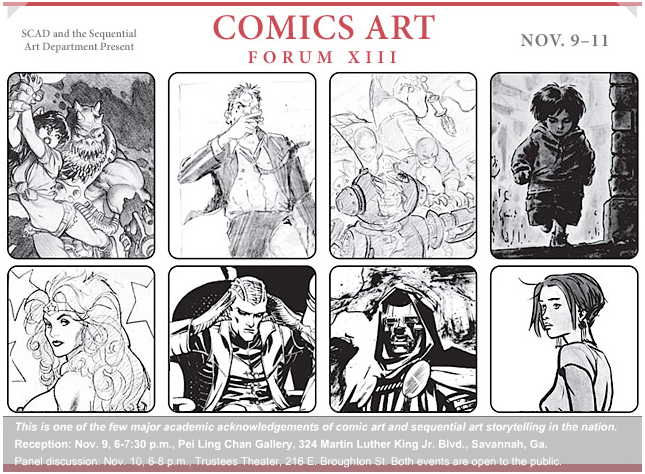 Workshops (10 a.m.–1 p.m.) and portfolio reviews (2:30–5 p.m.) for sequential art students on Friday and Saturday. The panel discussion (6–8 p.m.) in Trustees Theater, 216 E. Broughton St. is open to the public. 'Sup D.A.D. ^_^ You spelled my name wrong in your link dealie. I don't know what you're talking about... surely I (who hates being spelled "Allen" or "Alan") would never err in the realm of name spelling. I am surprized that you have so little out there for folks to look at... Where's THEKLUNK.COM or KLUNKYDOODLEDOO.NET? I like how your school has fancy events and stuff like this... and all I get is an expired coupon to Sarnoff's art supply from the basement advising office. You know, i thought about it... and the idea of me getting fatter is an odd way to seek vengeance. I miss Sushi Hama... It was so good. You only get fat on sushi if you get the fried ones. Those are the best. I liked the birthday dance-party! there is no good sushi if Savannah. No good chinese food either. Not much good food at all actually. Everything that people like is so sub par... Just because it's the best in town doesn't mean it's good. There are 2 good Thai places though. Mmmm. Thai.